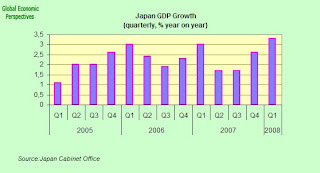 Is Japan's Long Running Economic Expansion Finally Drawing to a Close? 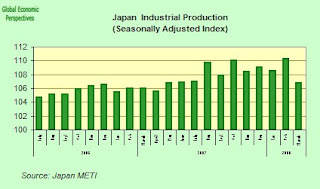 Despite the relatively healthy performance turned in by the Japanese economy in Q1 2007, the signs are that the impact of rising food and energy costs and slowing global economic growth (and hence demand for Japanese exports) are now taking their toll. 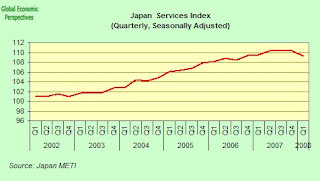 Japan's services sector, for example, bounced back slightly in March as consumers spent more to repair their cars, play golf and go to the theater. 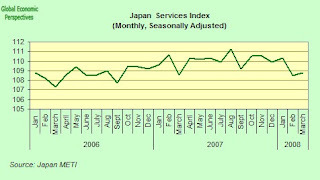 The tertiary index, which is a gauge of household and businesses spending on items ranging from phone calls, to power and transportation, increased 0.3 percent from February, the Trade Ministry said today in Tokyo, The uptick however followed a revised 1.6 percent decline in February, and as we can see from the chart below we are still below the level reached in January, and year on year the index is virtually unchanged. Indeed tertiary demand, which accounts for about 60 percent of the economy, fell for the second consecutive quarter in the three months ended March 31, producing the first back-to-back decline since the economy emerged from a recession in 2002. Evidence that households are cutting back on spending is now becoming pretty general and indeed household spending fell at the fastest pace in 15 months in March as prices of frequently purchased goods from milk to eggs climbed at an annual rate of 3.2 percent , more than double the growth in wages in that month. 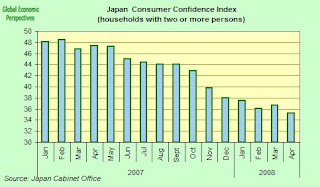 Consumer confidence also dropped to a five- year low in April. And consumers won't be able to count on higher paychecks to offset the impact of inflation because companies are unlikely to raise pay at a comparable rate as surging raw-material costs erode profit margins. In just one sign of the times example Japan Airlines announced last week that it was going to cut salaries and other benefits by 5 percent because profits are likely to drop 44.5 percent this year on fuel costs. Meanwhile the Bank of Japan today kept interest rates on hold at their first meeting following a substantial reduction in their growth forecast. Today's meeeting was also of note since it marked the effective shelving of a two-year policy of seeking to raise interest rates. 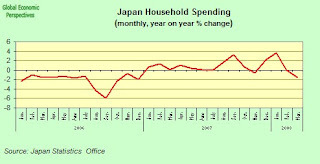 ``Japan's economic growth is slowing, mainly due to the effects of high energy and materials prices,'' the central bank said. 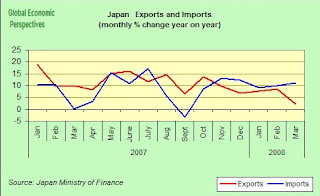 Exports rose at the slowest pace in almost three years in March. At the same time production fell the most in at least five years in March. The Bank of Japan dropped a call for gradual rate increases from its twice-yearly economic outlook published on April 30 and cut its estimate for this fiscal year's growth to 1.5 percent from 2.1 percent. It also forecast that consumer prices excluding fresh food will climb 1.1 percent, raising its inflation projection from 0.4 percent. Over the last two years the economic outlook has consistently said that the bank would pursue higher interest rates, repeating the assertion that borrowing costs need to rise gradually as long as the economy keeps growing and prices remain stable. This has now been dropped but the report did retain a warning that continuing to keep rates at their current low levels could cause excessive investment and hamper growth in the long run.